It is necessary to consider another point in examining the character of these principalities: that is, whether a prince has such power that, in case of need, he can support himself with his own resources, or whether he has always need of the assistance of others. And to make this quite clear I say that I consider those who are able to support themselves by their own resources who can, either by abundance of men or money, raise a sufficient army to join battle against anyone who comes to attack them; and I consider those always to have need of others who cannot show themselves against the enemy in the field, but are forced to defend themselves by sheltering behind walls. The first case has been discussed, but we will speak of it again should it recur. In the second case one can say nothing except to encourage such princes to provision and fortify their towns, and not on any account to defend the country. And whoever shall fortify his town well, and shall have managed the other concerns of his subjects in the way stated above, and to be often repeated, will never be attacked without great caution, for men are always adverse to enterprises where difficulties can be seen, and it will be seen not to be an easy thing to attack one who has his town well-fortified, and is not hated by his people. The cities of Germany are absolutely free, they own but little country around them, and they yield obedience to the emperor when it suits them, nor do they fear this or any other power they may have near them, because they are fortified in such a way that everyone thinks the taking of them by assault would be tedious and difficult, seeing they have proper ditches and walls, they have sufficient artillery, and they always keep in public depots enough for one year's eating, drinking, and firing. And beyond this, to keep the people quiet and without loss to the state, they always have the means of giving work to the community in those labors that are the life and strength of the city, and on the pursuit of which the people are supported; they also hold military exercises in repute, and moreover have many ordinances to uphold them. Therefore, a prince who has a strong city, and had not made himself odious, will not be attacked, or if anyone should attack he will only be driven off with disgrace; again, because that the affairs of this world are so changeable, it is almost impossible to keep an army a whole year in the field without being interfered with. And whoever should reply: If the people have property outside the city, and see it burnt, they will not remain patient, and the long siege and self-interest will make them forget their prince; to this I answer that a powerful and courageous prince will overcome all such difficulties by giving at one time hope to his subjects that the evil will not be for long, at another time fear of the cruelty of the enemy, then preserving himself adroitly from those subjects who seem to him to be too bold. Further, the enemy would naturally on his arrival at once burn and ruin the country at the time when the spirits of the people are still hot and ready for the defense; and, therefore, so much the less ought the prince to hesitate; because after a time, when spirits have cooled, the damage is already done, the ills are incurred, and there is no longer any remedy; and therefore they are so much the more ready to unite with their prince, he appearing to be under obligations to them now that their houses have been burnt and their possessions ruined in his defense For it is the nature of men to be bound by the benefits they confer as much as by those they receive. Therefore, if everything is well considered, it will not be difficult for a wise prince to keep the minds of his citizens steadfast from first to last, when he does not fail to support and defend them. 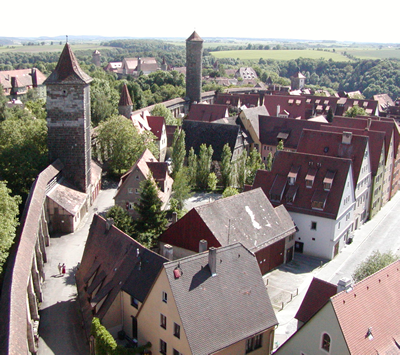 The free imperial city of Rothenburg ob der Tauber with defensive wall, built in 1070 – not a threat, but still a deterrent. In this chapter Machiavelli continues his additional comments on the exceptional ways of holding a state. Here he proposes a strategy for holding a weak state, which is to emulate the defensive methods of the German free cities. In Machiavelli’s analysis, power as an active, coercive principle. Lacking power does not mean that a prince is defenseless, it means that he is not a threat. To be powerful, a prince must be able to field an army. Recall that “All armed prophets have conquered, and the unarmed ones have been destroyed” (Chapter 6 ). Furthermore, it is not enough for him to have sufficient resources to field an army, to be powerful, he must also have autonomous control of those resources. That is, he must not be a puppet who is dependent “upon the goodwill and the fortune” (Chapter 7) of someone else. He will have more to say on this topic, especially in Chapter 19.